When it comes to the Left's nastiness, it doesn’t seem to matter what someone is going through - especially those affiliated with the name "Trump." Liberals will stoop to brand new lows to make themselves feel important. Particularly those who were Hillary Clinton shills for years. 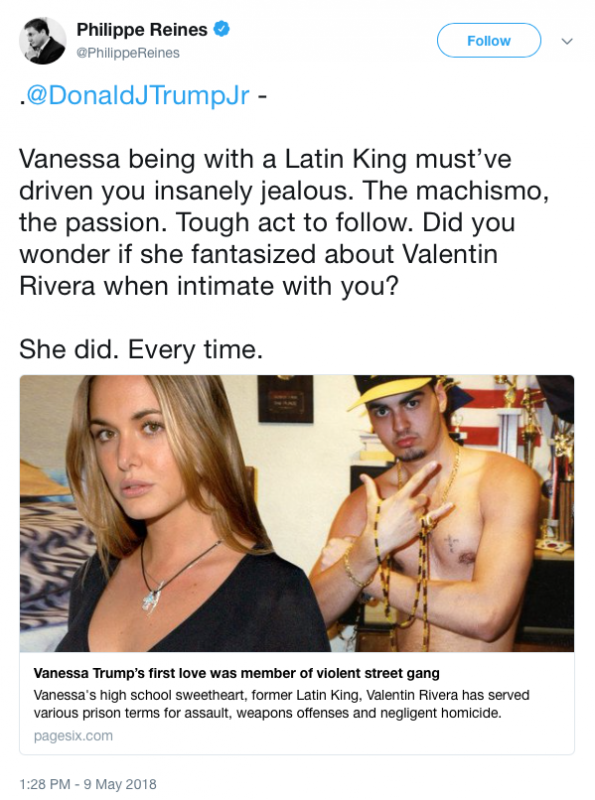 Professional scumbag and former senior adviser to then-Secretary of State Clinton Philippe Reines tweeted a vulgar slur against Donald Trump, Jr. Wednesday afternoon, referencing a Page Six article about Trump's soon-to-be-ex-wife, Vanessa, that focused on her high school relationship with ex-Latin King gang member Valentin Rivera. 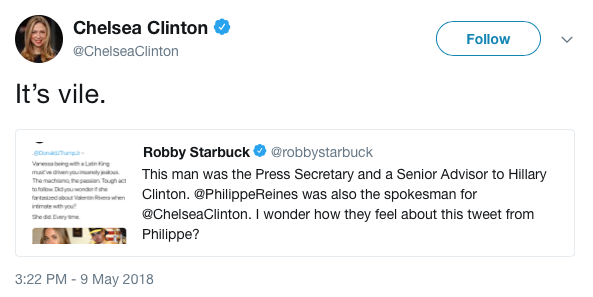 Reines is proud of his alleged insanity, as evidenced by his bio on Twitter where he quotes former White House Chief of Staff to President Bill Clinton, John Podesta. “Phillipe [sic] is the only person about whom you’re torn between patting him on the back and trying to get him committed to Bellevue,” Podesta said in 2015, according to Reines. What the hell is the matter with these people? First of all, Trump's relationship with his wife is none of Reines’ business. To be honest, I had to look up who Raines’ is and was -- because in the grand scheme of things, he’s as insignificant as the story he tweeted about.